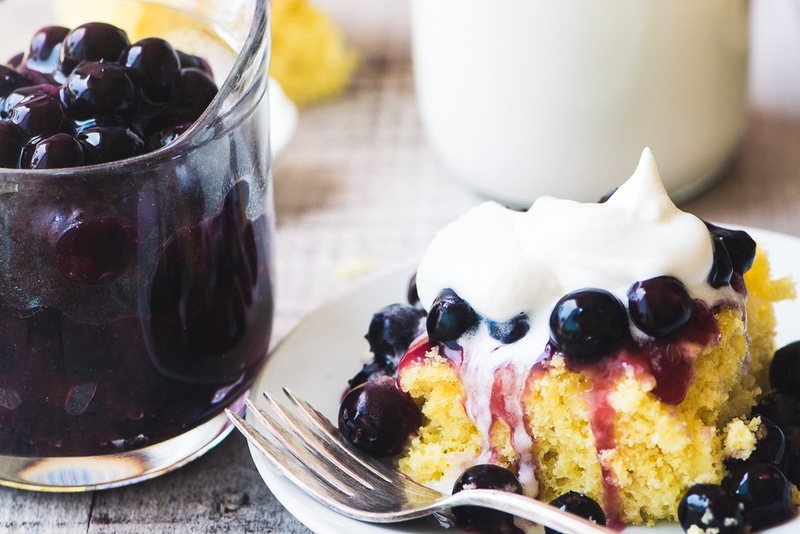 Blueberry Lemon Shortcake recipe ~ this yummy summertime dessert will win you over with its juicy blueberries tumbling over a moist lemony cake! Preheat the oven to 350F Spray a 9x13 baking pan and set aside. In a large mixing bowl whisk together the cake mix, eggs, vegetable oil, lemon juice, and water. Whisk until well blended. There will be some lumps, don't worry. Pour the batter into the prepared pan and bake for 22 -25 minutes, or until a toothpick inserted in the center comes out without wet batter clinging to it. Set the cake aside to cool. Put the blueberries, water, lemon juice, sugar, and dissolved cornstarch in a saucepan and bring to a boil. Lower the heat and simmer for about 5 minutes, until the sauce thickens and turns dark purple. Stir carefully so you don't mash the blueberries. Whip the cream with the sugar and vanilla until soft peaks form. Slice the cake into 12 pieces and serve with the blueberry sauce and whipped cream.